Despite 25 years of pain and injustice, which Merseyside MP is backing The S*n? Frank Field, MP for Birkenhead is the answer. As the May local elections approach, Mr Field recently returned to posting again on his Twitter account. There have been suspicions in the past that Frank can be “quite proactive” when it comes to advancing the fortunes of local Labour councillors. They very much need a leg up around here, and there’s no time like the present. 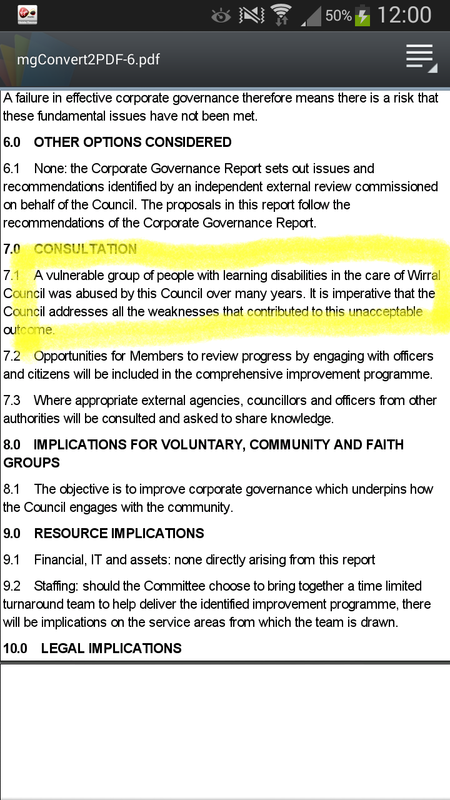 People will never forget that despite repeated attempts to cover it all up, Wirral Council is a self-declared abusive council (£736,756.97 unlawfully taken from the bank accounts of learning disabled Supported Living Tenants over an 8 year period – and whistlebower Martin Morton disposed of). So would Frank be returning despite “Purdah”, the imposed period of ‘radio silence’ prior to elections, which is supposed to protect democracy (for what it’s worth) and establish a level playing field? And would Frank’s new PR drive be popular, ethical and dignified? Note the date of the first Tweet. Done to coincide with the start of the Hillsborough Inquest in Warrington. WHAT IS MURDOCH UP TO HERE? Is this yet more distraction and attempted division? Without shame, and despite the despicable behaviour of The S*n editors /owner at the time (and pretty much ever since), Frank Field appears to be putting any principles he may have to one side and clambering onto a useful bandwagon. That seasoned and valiant protector of the poor down through the decades, billionaire Rupert “Stop the Greedy Fleecing the Needy” Murdoch, has mounted something called a #RipoffBritain campaign, for his own dubious and unstated reasons. 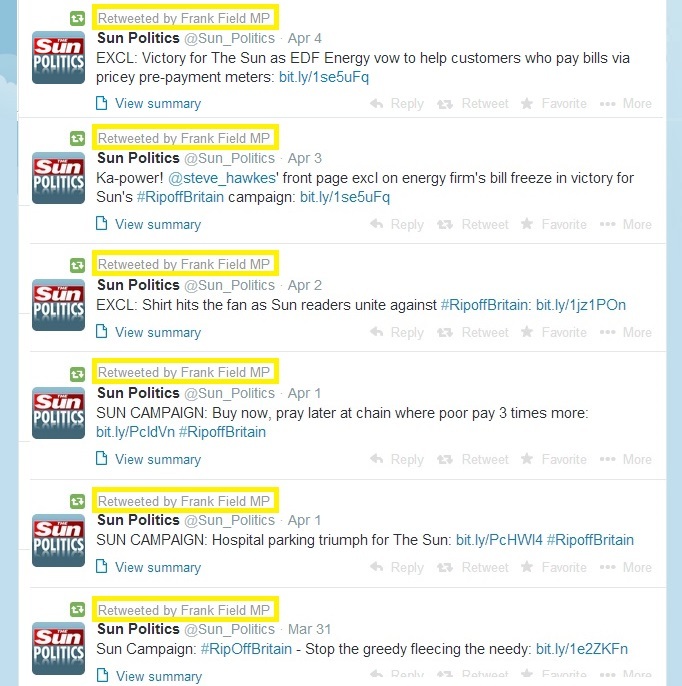 It could be a precursor to Murdoch declaring The S*n’s backing for the Torylite Labour party. Maybe he’s angry with Cameron for agreeing to Leveson. Maybe the rag has declared its allegiance to Miliband already. Maybe he simply wants to draw working class people’s attention AWAY from the Warrington inquest. I’m not sure because I’m not a reader, in fact there’d be more chance of me falling for pretend ”scouser” Esther McVey than putting money directly into Rupert Murdoch’s pocket. I do own up to touching the thing when I’m in the newsagents, as I busily conceal the rancid stack of rags beneath copies of The Times (which nobody buys around here anyway). What the hell is Frank Field MP up to? This entry was posted in General and tagged Frank Field, Murdoch, The S*n, Torylite, Twitter. Bookmark the permalink. 6 Responses to Despite 25 years of pain and injustice, which Merseyside MP is backing The S*n? If I had not seen it with my own eyes I would not have believed it our local formally respected MP would have had anything to do with this scumbag newspaper after all they said about about the 96 tragic victims has this man no shame. If local people see these tweets then nobody in their right mind should vote for him. The Frank Field candidacy for Birkenhead was dodgy right from the start, back in 1979, but that’s a whole other story. It’s safe to say if the correct, legitimate candidate had been nominated according to the rules at the time, the people of Birkenhead would never have had this person inflicted on them, and history would be quite different. It’s time these ‘job for life’ Labour/Tories were given the bullet. ◾Did not hook up with Rupert Murdoch in a short-lived bogus campaign to “address poverty” whilst boosting sales of The S*n.